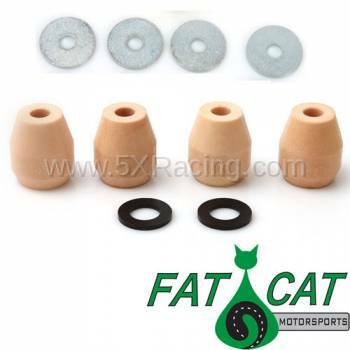 Although we offer our own branded Miata Bump Stop kits, we wanted to continue offering the Fat Cat Motorsports Bump Stop kits in their original form as once offered on the Fat Cat website to those who desire to obtain a legacy kit, or to those who want to replace their existing FCM kit with the same one. For cars at stock ride height/stock springs or slightly lowered. A good choice for street/mild sport applications. Since 2005 the Fat Cat Motorsports name has grown very popular among Miata racers and autocrossers. Focusing on highly specialized suspension builds, FCM is becoming a leader in the industry and fast drivers are turning to them for results. Launched by an engineer who found the Miata to be a perfect platform for autocross, today FCM supplies a complete line of suspension products from custom re-valved shocks in their coilover kits to re-engineered bump stops. Customers range from national champions to folks simply wanting a better ride, and FCM products have been featured on projects in Grassroots Motorsports magazine and Edmunds? Inside Line blog. In our Miatas, the bump stops were designed by Mazda to be an integral and functional part of the suspension. A common modification to the OEM bump stops has been to simply cut them, which cuts down their reliability and life span. Fat Cat bump stops are actually engineered to be paired with today?s most popular shocks, and we stock the bump stop kits for all shock brands we carry. Copyright © 2019 5X Racing. All Rights Reserved.